Heinrich (Henry) Blanck, shoemaker, born in Lehe, Germany, the son of Heinrich Christopher Blanck and Dorethea Wenzel, immigrated to Hoboken, New Jersey, circa 1870 where he married Melusine Erxmeyer in 1874. They were the parents of six children. For more information on Henry Blanck, click on the picture of the shoemakers. The word Blank appears in Germanic language (Middle-High-German or Old-High- German) before the 10th century and seems it meant something like: white, pale, bright. Melusine Erxmeyer immigrated to Hoboken, N, J. in 1872. Melusine's family , including her mother, Dorethe Hogrefe Erxmeyer, two brothers, Fred and Henry Erxmeyer, and three sisters, Julia Erxmeyer Lehman, Berthe Erxmeyer Bremer and Mary Erxmeyer Rosenthal also immigrated to Hoboken. Melusine married Henry Blanck in 1874. For more information on Melusine Erxmeyer click on the flower. Johann Jurgen Erxmeyer married Anne Marie Ilsabe Berkmeyer of Oberschönhagen in Reelkirken Germany in 1778. Fritz Kettler, longshoreman, son of Christian and Gertrude Kettler, born in Freisland circa 1862. He immigrated to the United States circa 1883 where he married Johanna Peter. The Kettlers lived both in Brooklyn, New York and Hoboken, New Jersey. For more information on Fritz Kettler and his family, click on the image of the docks. Hanna/Johanna Peters/Petersen , born circa 1860 in Norway, immigrated to America circa 1885 where she married Fritz Kettler. After the death of Fritz, she married Johannus Jensen. They lived in Hoboken, New Jersey. For more information on Hanna Peters/Petersen, click on the picture of Norway. 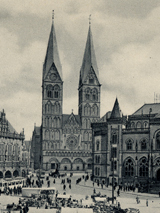 Many young men who lived near the major German sea port of Bremen when to sea. The Erxmeyer brothers, Friedrich (Fred) and Heinrich (Henry), their future brother-in-laws, Henry Blank and Johann Lehman, and J. Berend Petermann all served with the merchant ships out of Bremen. They all ended up living in Hoboken, New Jersey. I also had ancestors who immigrated from Germany in the 1880s, spent some time in Brooklyn, New York and then moved to Hoboken, New Jersey. To see pictures of the ships on which the Blanck family immigrated, click on the photo of the Bremen. The Blancks in Lehe Germany were linen weavers. For information and pictures, click on the picture of the linen loom. Henry Blanck and the Erxmeyers were among the millions of German American immigrants. 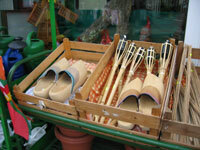 For images and information about the German people, customs, houses and more, click on the picture of the wooden shoes. Henry Blanck and the Erxmeyers were among the millions of German American immigrants. For information on and images of the German American in United States click on the image of the German American Family.